Hi! Welcome! I’m so glad you stopped by today! Have you had sickness in your home lately? We are going on 4 weeks here. FOUR! Everyone has been on antibiotics at least once and now we’re passing around the strangest virus I’ve ever had. Sick kids can be so hard when you’re trying to run a household. Especially if you’re sick too! 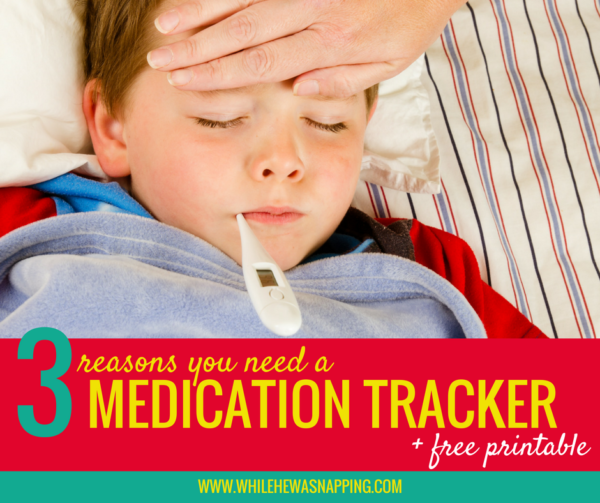 But tracking your family’s medication shouldn’t be a hassle – that’s where this medication tracker will come to the rescue! DISCLAMER: I’m not a medical professional and this is not medical advice! I’m just a mom who has had sick kids, been sick myself, had a sick husband, and missed medication doses or couldn’t remember what time it was when I gave him medicine last time. This is something that helps me keep track and stay on top of medicating my family safely and confidently and I wanted to share it with you, hoping it will help you do the same for your family. Have you ever wondered… “Did I give him his last dose?” or maybe “when did I give her medicine last?” When there’s illness in a family it affects everyone and trying to remember when the last dose of medication was given should be the least of your worries; but often, it’s not. I know how all those doses run together when a fever lasts days or a round of antibiotics stretches on and on. Save yourself some worry, uncertainty and maybe even sleep! Make it super easy to medicate your sick family with confidence with just a glance. And these are a MUST-HAVE in families where more than one person might give the medication. Never worry about double dosing again! IS MEDICATING YOUR FAMILY SAFE AND EASY? a tired mom or dad, giving medication every 4-8 hours, around the clock? Day and night? a daycare provider that cares for, and occasionally medicates, children you don’t live with? one of many adults that may give medication to one child or other adult? ever sick yourself, but still have to keep up with your life and sometimes find yourself missing medication doses? If you said yes to any one of those, this medication tracker can help make your next bout of sickness a little easier to manage. What are you waiting for? You won’t have to wonder, “What time was that last dose? Has it been 6 hours yet?” You’ll know exactly when that next dose is due. This is nice to grab and take to the doctor, if you get that far. If multiple people are giving medicine, this is the perfect way to make sure there are no double dosing accidents. Keep your kids safe! 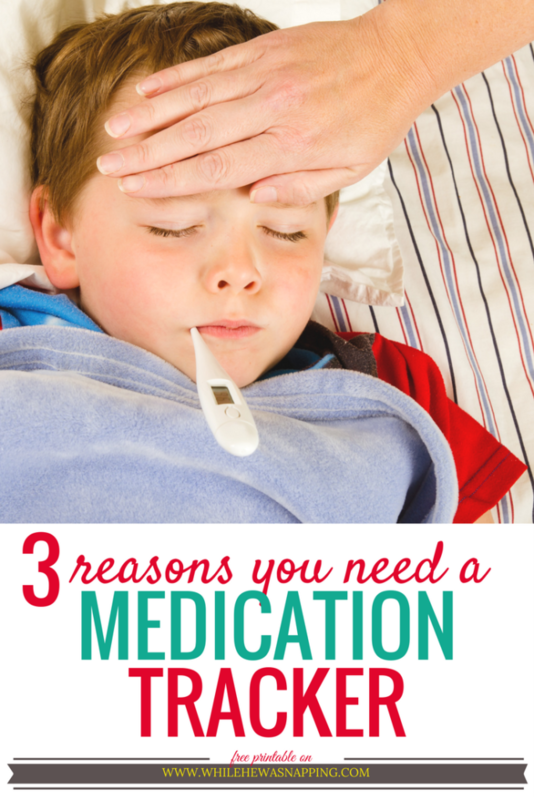 If you’re the one who is needing medication, it can be hard to run a household while you’re sick. Not feeling well and having to keep up life is a lot to think about. Ease your stress by tracking your medication so you can focus on what really matters. This is super simple. You won’t need anything fancy. This medication tracker is a single page, but print as many of them as you need. One for each sick child or for as many doses as you need to track. The bright colors will hopefully help remind you to mark your progress and maybe bring some feel-good power to your day… after your next medication dose kicks in, of course. Now, print your medication tracker and medicate confidently! Of course, you can simply download and print the file. It’s usable as it is. But, I like to make my organizer pages re-usable. It’s super easy, but totally optional. The only thing you really NEED is the download file and a printer to print it on. 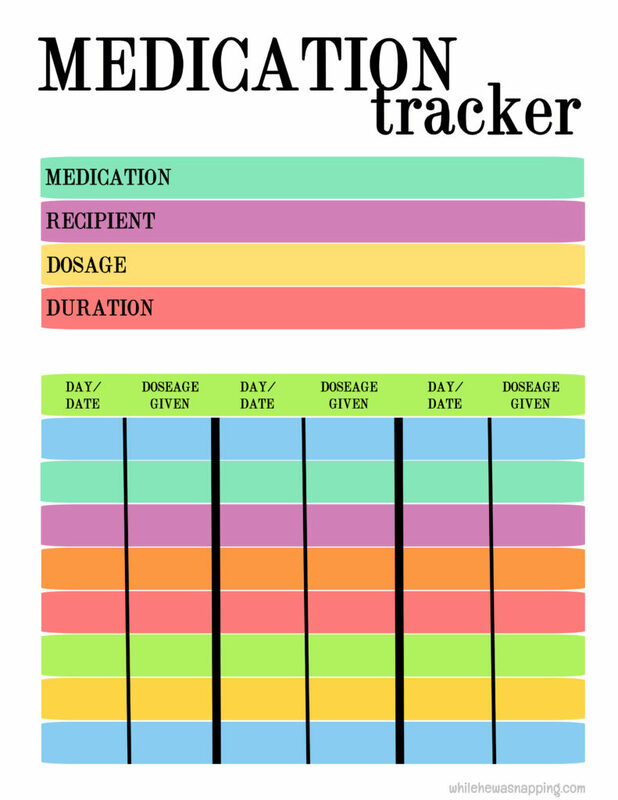 Medication Tracker –> Get the printable PDF! Step #1: Download the medication tracker and save it to your computer. Step #2: Print the medication tracker. If you are going to make it re-usable, I suggest using a heavier paper such as card stock. If you’re only going to use it once, regular printer paper is fine. Step #3: Turn on your laminator and let it warm up. While the laminator is heating up, slide your printed medication tracker inside a thermal laminating sheet. Step #4: When the laminator is ready, run the laminating pouch through the laminator. Pull out the pouch and lay it flat on a cool surface until it cools to the touch. Step #5: Cut a strip of magnet tape and adhere it to the back of the medication tracker. I prefer to put a strip on the top and one on the bottom as well. Step #6: Use a wet erase pen to write on the medication tracker. DISCLAIMER: I don’t have a lot of experience with the cold laminating pouches. I’ve only ever used the small sizes and my results have been mostly good. I prefer the hot laminating method though. Step #1: Prep the laminating pouch as directed on the package. Follow all instructions. Step #2: Cut a piece of magnet tape and adhere it to the back of the medication tracker. I usually do a long piece at the top and a long piece at the bottom. Step #3: Use the wet erase marker to write on the medication tracker. Step #1: Slide the page into the plastic page protector. Step #2: Use a magnet to hang medication tracker on the fridge. Or you can use some magnet tape on the back of the page protector. Step #3: Use wet erase markers to write on the medication tracker. Congratulations! You’re ready to take on the next illness that comes your way. You’ll be able to give your family the medication they need, when they need it. You won’t have to wonder if it’s really been 6 hours since the last dose or if you actually gave that medicine this morning. At a glance, you’ll be confident that you’re doing all you can to manage those pesky germs. Do you have any tricks for dealing with sick kids? Leave your tips in the comments below. And if you love this medication tracker, check out the entire 47-page set of organizer pages in The Organized Family Starter Kit, available on Etsy. Has clutter taken over your home during the winter months? The holidays and then two of my boys’ birthdays always tend to leave my home feeling a little… messy. When the sun finally starts shining, I want to get our things back under control. This cleaning checklist makes it easy to stay on track and get the extra clutter out. This list is 2 pages of tasks, divided by room, that will help you clean and de-clutter your home. The winter months often bring an influx of things into our homes – I blame it on the holidays – and this is a great place to start weeding some of the things out. It’s much easier to keep your home together if there aren’t so many pieces. You don’t need all the things! Get rid of some! I promise you won’t miss them. 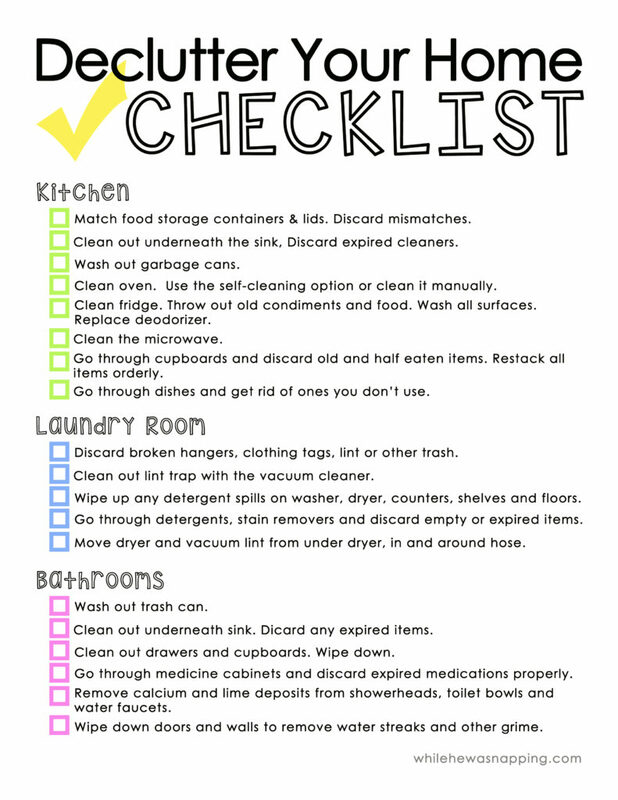 This list is for the busy household that doesn’t have days and weeks to spend cleaning up their home. It’s for the stay-at home mom who spends days making snacks and chasing toddlers. This list is for the working mom who has limited time in her home and with her family. It’s for the family that would rather play together than spend weekends cleaning. It’s for the household that is full of things they don’t use and love. 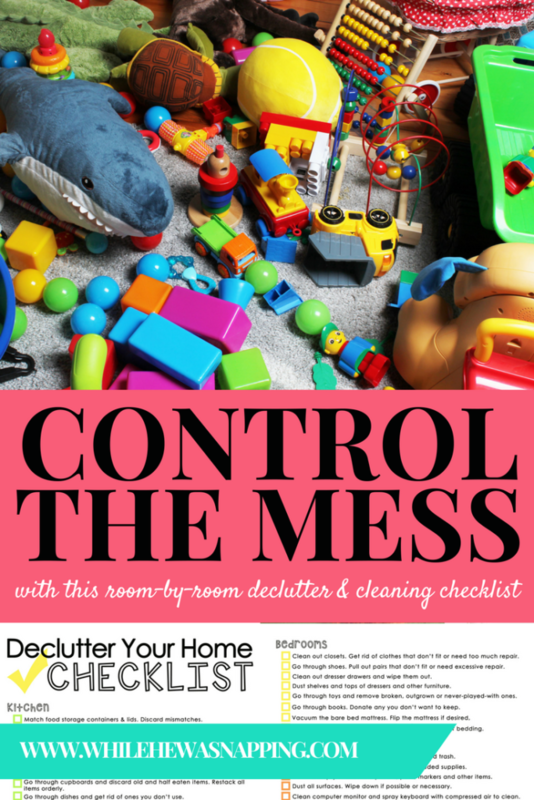 If you’re not sure where to start, if you’ve started before and gotten overwhelmed, if your time is limited or if you’re tired of all the things taking over your home, then this list will help! Disclaimer: This list doesn’t include tasks such as washing walls in every room, baseboards, or window tracks. It doesn’t include dusting ceiling fans, dusting in general, or cleaning carpets. Those things should still be done, eventually. The main focus of this list is getting unnecessary things out of your home. Once there are fewer things, these deeper cleaning jobs will be easier to complete. So, get the things out and then go back and do the window tracks and baseboards. WHY DO YOU NEED THIS CLEANING CHECKLIST? Simplify the huge project of deep cleaning your home by using this checklist. You’ll be able to work room-by-room, clearing clutter from your home in an efficient manner. Remember, you want to cut down on the things in your home while cleaning a little too. CLICK TO DOWNLOAD YOUR OWN CHECKLIST!! This may seem obvious. Just check everything off the list, right? Check off all the boxes and you’re done. Sure, you can do that. But, I want to let you in on a little secret. That’s not the only way to rock your clean and purge project! These pages are divided into rooms, but they are designed so the tasks can be done depending on the time you have available. Most of the tasks can be done in 45 minutes or less. Some can be done in as little as 10 or 15 minutes. Save the tasks that take longer for when you have the time to conquer them. And get the whole family to help and knock that list out even more quickly! When you see everything all at once, it’s overwhelming. Cut it down and focus on one space at a time. It’s much easier to clean one room than an entire house. If you can’t do a whole room at one time, cut that down too and focus on just the closet or just the dishes or just under the sink. If you focus on one space, get it cleaned and de-cluttered, then move on, you will be encouraged by the visible progress. The clean room will motivate you to keep it that way and to keep going on the rest of the tasks. CAN A CLEANING LIST GIVE YOU FREEDOM? YES. It can and it will, if you take the de-clutter part seriously. Cleaning is good, simplifying and de-cluttering is better! Take the list one room, one area, one task at a time. Before you know it, you’ll find your groove. Throwing things out won’t be so difficult. It’s okay if it takes a little time to get through it all. And it’s okay if your home still looks “lived in” – you do, indeed, live in it. But, I promise you will love the freedom that having fewer things will give you. NOT QUITE READY TO COMMIT TO THE WHOLE CLEANING CHECKLIST? 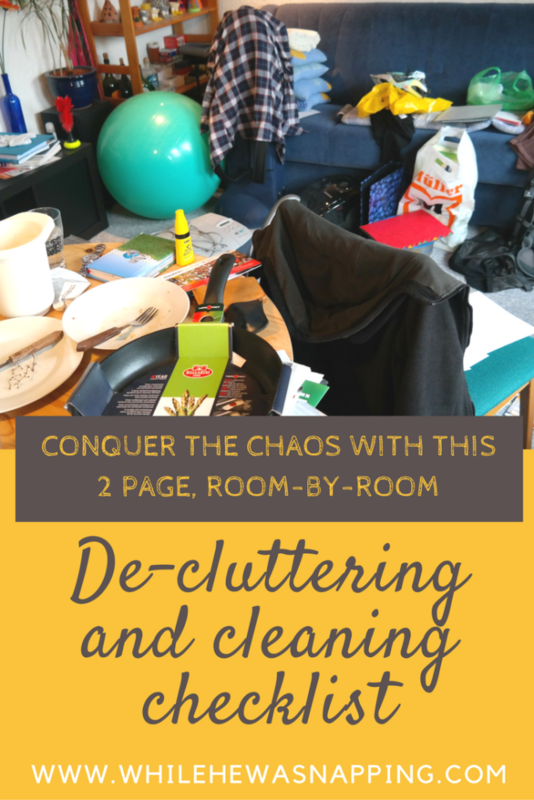 Does de-cluttering your entire house overwhelm you? 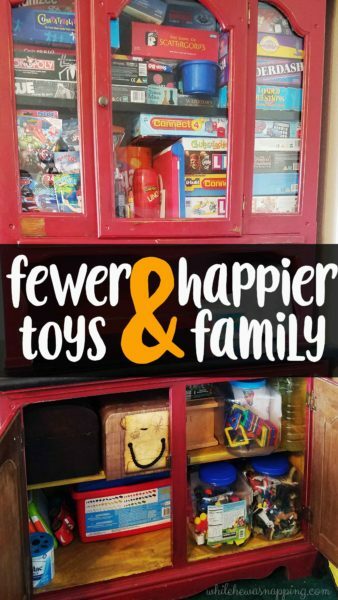 Start small and make a big impact with these 6 steps to fewer toys and a happier home. Not ready to get rid of the toys completely? Find out how to set up a toy rotation system. Your home will be less cluttered and your kids will think Christmas comes every time you rotate the toys out. 22 things that will make Christmas easier this year! Are you getting ready for the holidays yet? Do you wish there was a way to make your holiday preparation easier? Do you just love the most wonderful time of the year? If the holidays have you in a stressed out craze already or if the mention of mistletoe, sipping hot cocoa, and winter wonderlands make you a little giddy inside, listen up! Christmastime is my favorite time of the year! But, it’s busy and crazy and sometimes even stressful! Well, you can just call me Santa; because, I have a holly jolly surprise just for you that will help you calm the stress so you can enjoy the season! Remember the fall bundle that I and some other great digital designers put together a couple months ago? It was a complete and total HIT; and, as soon as it was over we had tons of you asking us if we could do this again for Christmas! Well… You asked. We listened! That’s right! We’ve done it again! I teamed up with 20+ other extremely talented designers. Some of them are big names you already know and love, and some of them are up-and-comers; but, they are all spectacular at what they do. This time, we created the ULTIMATE All Things Christmas bundle! ANNND – of course – we’re totally hooking you up with a crazy, killer not-gonna-believe-this deal!! Yes, this one is EVEN better than the last! Not even kidding. There’s tons of value in this bundle. If you’re like me, you’re on a strict budget for the holidays and don’t have a lot of extra cash to throw around. This is gonna help you out and be totally worth the cost. I cross my heart, pinky promise it’ll be worth every penny. 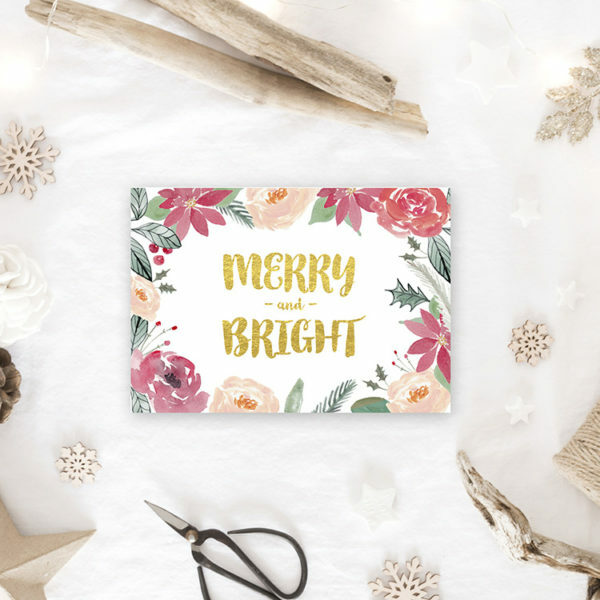 There’s over 500 pages of printables that will bring out the best kind of cheer for your holidays. 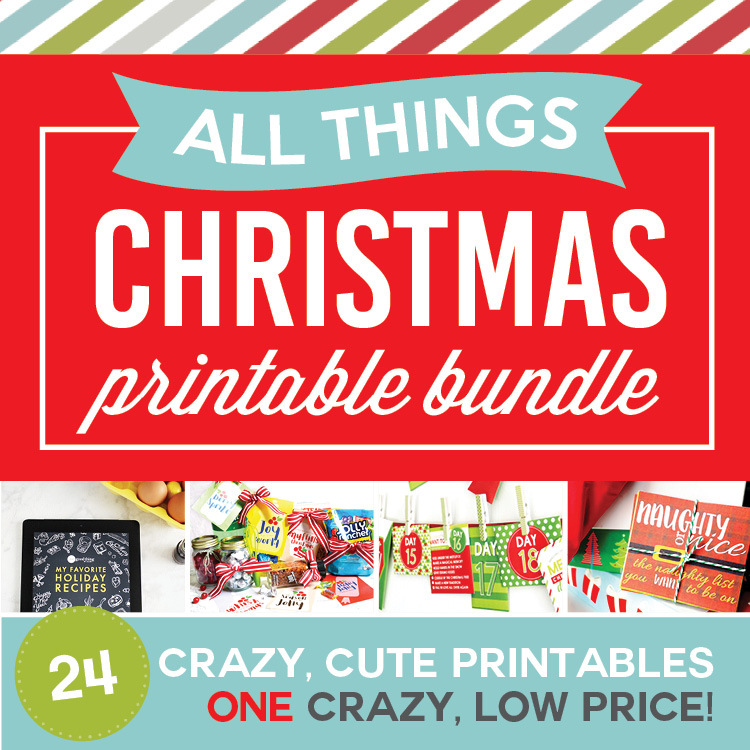 22 helpful Christmas printables— all for a CRAZY LOW price! No. That’s not a typo. You really will save over 90% when you grab this holly jolly bundle! Get gorgeous wall art, gift ideas, stocking stuffers, service ideas, holiday organizers, holiday recipes, and MORE all from your favorite bloggers! Order from me, and you’ll get a mini bundle of some of my most popular holiday printables as a FREE bonus! 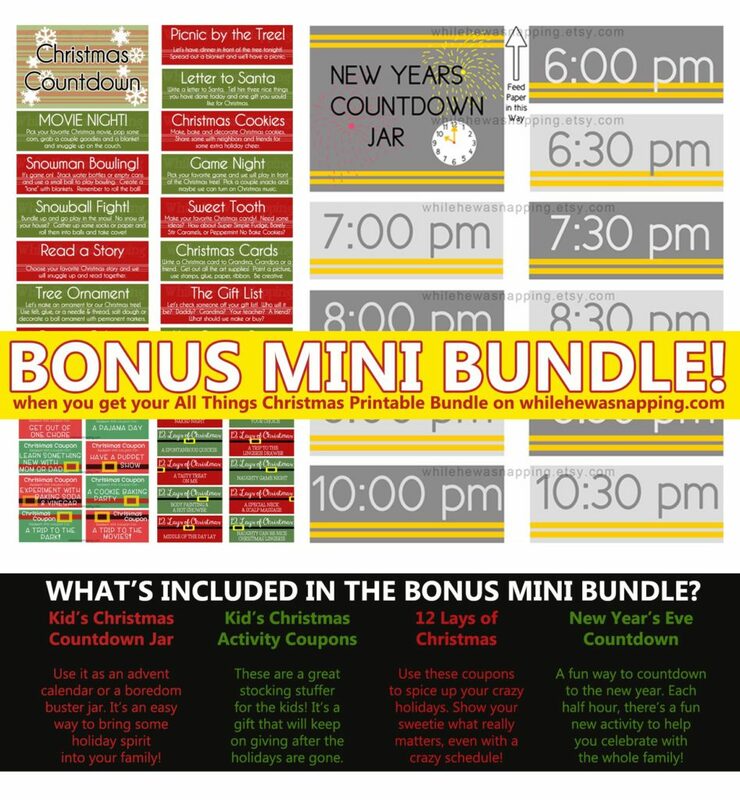 My bonuses alone are valued at more than you’ll pay for the whole bundle+bonuses! How’s that for a KILLER steal?! You’ll have to ACT FAST- this is for THREE DAYS ONLY! If you miss it, you’re out of luck and it will cost you hundreds to piece it together yourself. After that – this deal is GONE FOREVER! You definitely want to act fast to lock-in the best price! All together – it’s a collection of OVER 500 PAGES of darling printables… only available for a limited time! Get Yours Now for just $15! WANT TO TAKE A CLOSER LOOK AT EVERYTHING INCLUDED? WHAT EXACTLY IS IN THIS KILLER ALL THINGS CHRISTMAS BUNDLE? CHECK IT OUT! 2. 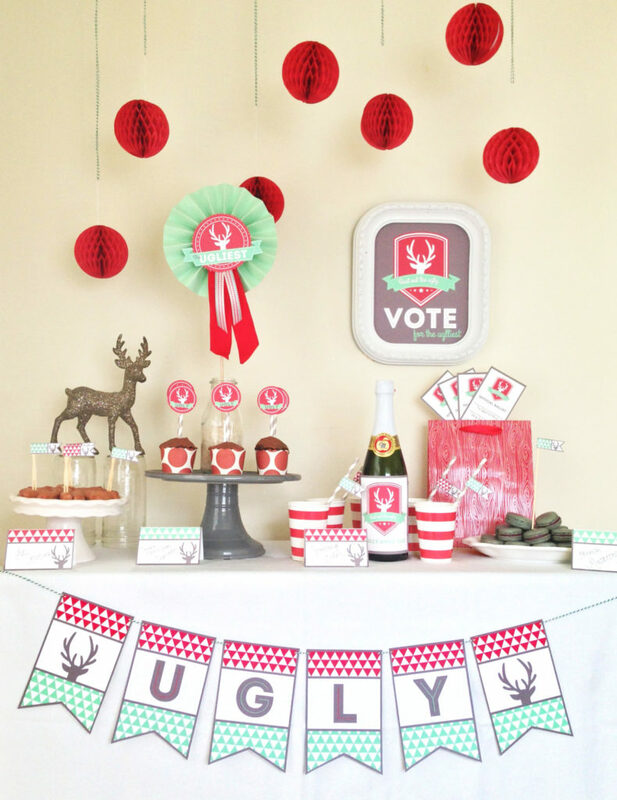 “Bust out the Ugly Sweater” Party Printables by A Pretty Little Party – Bust out your ugly sweaters for the most wonderful time of the year! Entertain your friends & family in style at the ugliest party in town. 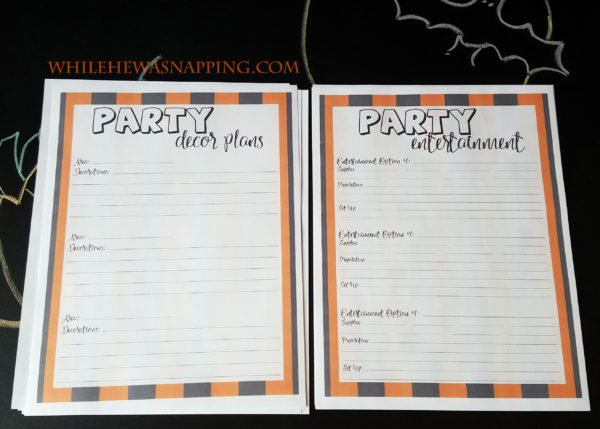 This printable pack includes everything you need to print, cut & create your own party. Including: Assembly Instructions, an 8×10 Voting Sign, 3×5 Official Voting Ballots, Award Badges for 1st, 2nd & 3rd place, Cupcake Toppers and Decorative Decals, Fold Over Menu Cards, Straw/Appetizer Flags, Wine/Sparkling Cider Bottle Labels, AND an “Ugly” Banner with two decorative pennants! 4. 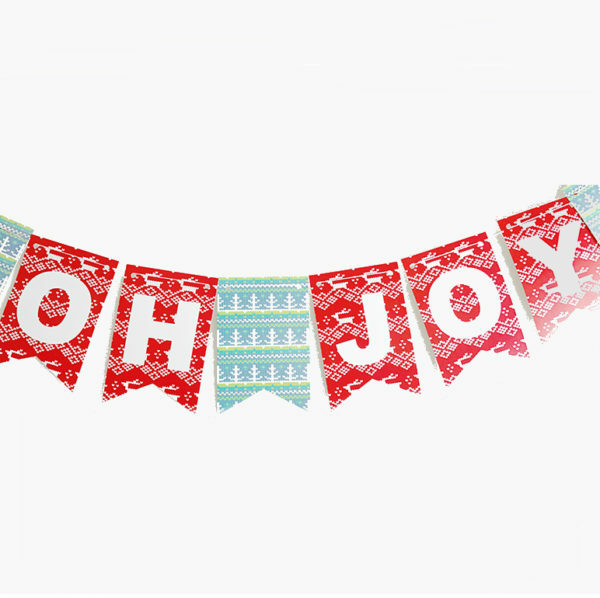 “Oh Joy” Banner by Andrea’s Notebook – Deck your halls with this fun and festive banner! 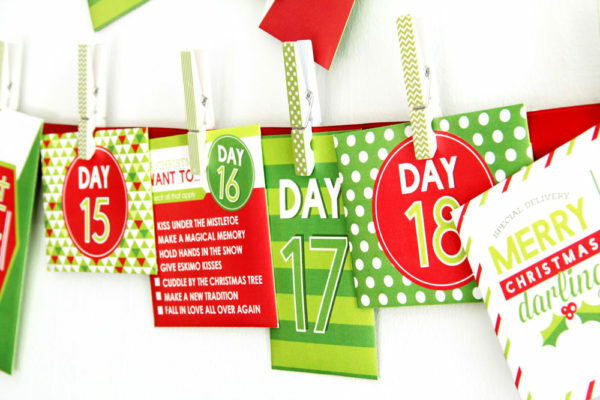 All you have to do is: cut, hole punch, thread, and hang! Doesn’t get much easier than that. And don’t you just adore this fun Christmas sweater pattern? 5. Watercolor Holiday Printables by Bella Love Letters – What’s better than curling up in a comfy chair listening to Dean Martin croon your favorite holiday tunes? How about a collection of watercolor printables – so gorgeous they’ll make you forget how cold it actually is outside? Each and every element was hand painted with love by Bella Love Letters and is print-ready. Use the charming “Baby, it’s Cold Outside” print as cheerful holiday decor (or heck, a quick gift for a neighbor! 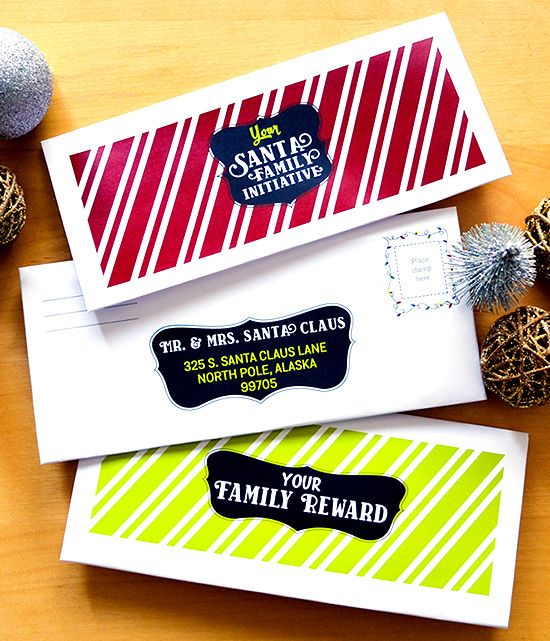 ), send the “Merry and Bright” greeting card to your grandmother (she’ll love it), attach the recipe card to a gift plate of your famous homemade cookies, and have the kiddos write their letter to Santa in style this year! 6. Christ-Like Christmas Service by Chicken Scratch n Sniff – Over 40 pages to help you fill your Christmas season with acts of love. Perfect to do as a family or for date night! From bag toppers to gift tags and candy wrappers, you and your family will discover just what you need to compliment your acts of kindness. 7. Two Christmas Countdowns AND Stocking Stuffers by The Dating Divas – TWO of our best-selling countdowns, the Spouse Christmas Countdown AND the Family Christmas Countdown to help you celebrate each day leading up to Christmas! 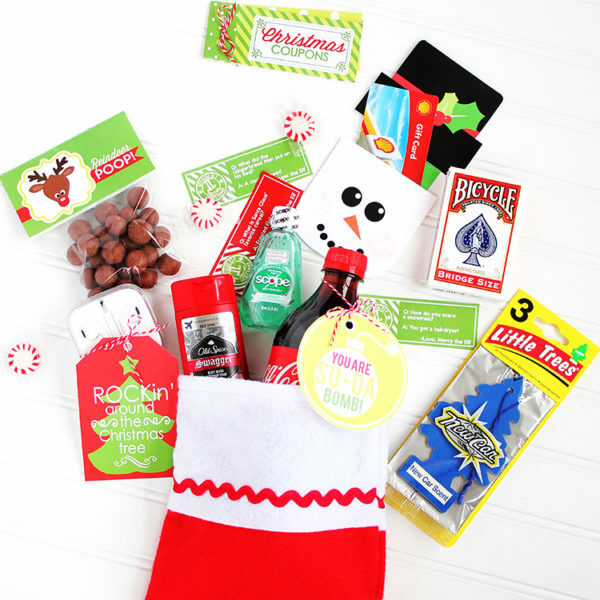 Our adorable Stocking Stuffer Kit complete with gift card holders, coupon booklets, Santa letters, and SO much more! 8. Intentional Christmas Planner by Faith Filled Parenting – The holidays can be so chaotic. We sometimes forget the true meaning of even enjoying the holiday season. This intentional planner will walk you step by step to a less-busy holiday. We will talk decor, meals, gifts, and more. This Christmas is all about simple, and this guide is your ticket to enjoying your Christmas with your family. Don’t miss out on this amazing deal! 9. Your Santa’s Family Initiative Kit by Frugal Confessions – Santa has issued your family an initiative this holiday season and a family reward under the Christmas tree is up for grabs upon successful completion. Are you and your kiddos up for the challenge? You will decide which of the 3 initiatives − spreading Christmas cheer, volunteering at a location, or completing a household project your family will complete together, and what the family reward will be. (Pssst: don’t worry about coming up with ideas yourself! Santa’s included a sheet of ideas to get your brain working). 10. 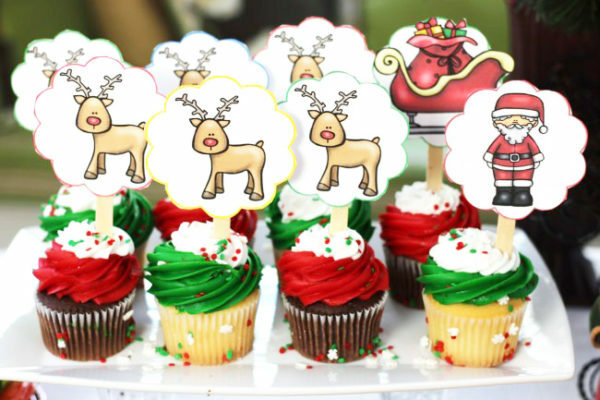 Merry Christmas Party Pack by Happy and Blessed Home – This printable party pack includes 30 pages of Christmas Party Printables including a Merry Christmas banner, Santa and his sleigh cupcake toppers, napkin rings, straw toppers, labels, invitations, and Christmas party decorations. 11. The Christmas Story- A 12-day Advent Banner by How Does She – A simple way to focus on the real meaning of Christmas: Christ! 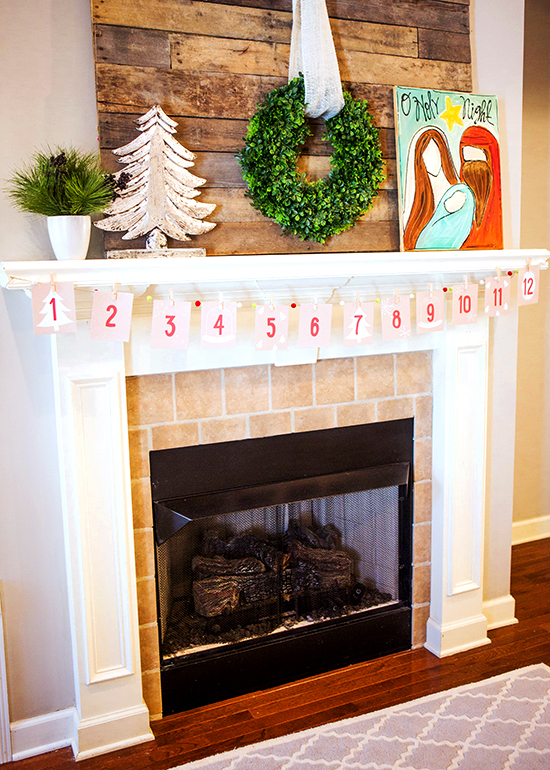 This darling 12-day advent banner features the story of the birth of Christ, as found in the Bible. Simply print the double-sided banner and flip over each day to reveal the full Christmas story by Christmas Eve. Perfect for stringing across the mantle or hanging on the tree. 12. Christmas Cootie Catcher with Bonus Christmas Lunch Jokes by Inspiration Made Simple – Worried about having a silent night around the Christmas dinner table? Well don’t be! 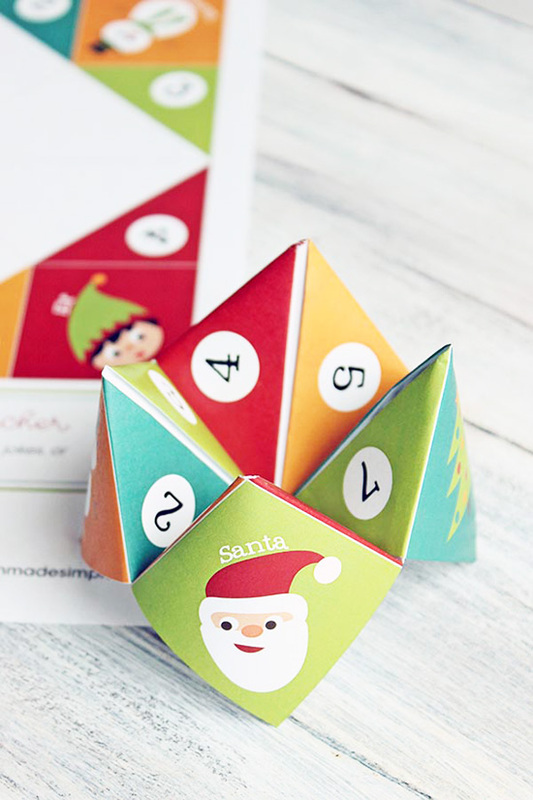 This Christmas Cootie Catcher is the perfect way to keep conversation light and fun. Bundle includes a pre-filled cootie catcher full of fun Christmas themed questions and jokes, as well as a blank version so you can come up with your own! BONUS! Also included is a set of 8 Christmas themed lunch jokes, sure to get the kids in the Christmas spirit. 13. Holiday Gift Tag Variety Pack by Less Ordinary Designs – Spruce up your holiday packaging with these printable gift tags from Less Ordinary Designs. They are incredibly easy to download and print and they take your gift wrapping to the next level. With 8 unique designs included, you will surely find something to coordinate with your wrapping paper or gift bag. Print one style or print them all! Why buy tags when you can print as many of these as you’d like, year after year? These are the perfect finishing touch and will look great top your holiday gifts. 14. 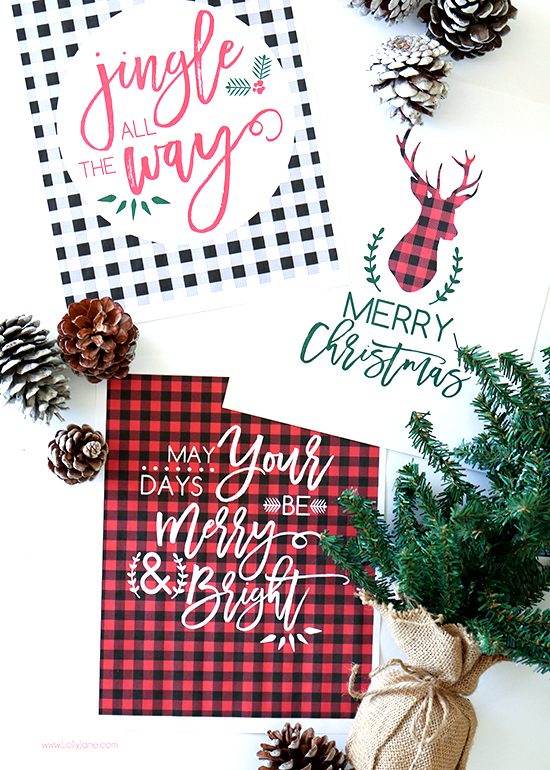 Christmas Printable Art Bundle by Lolly Jane – No time to decorate for the holidays? 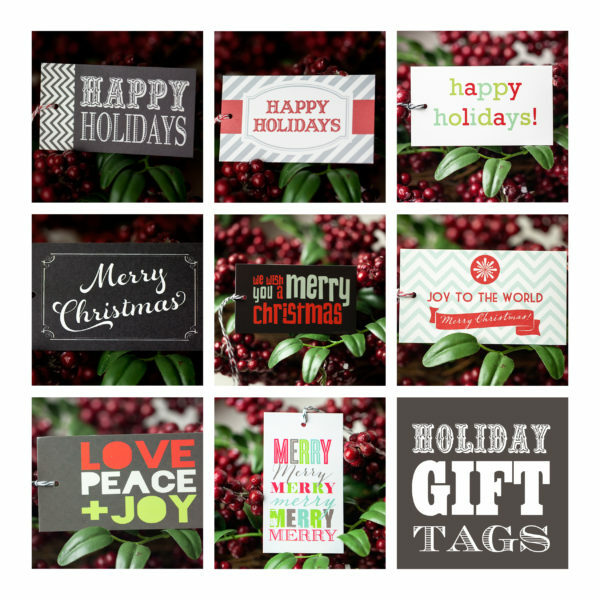 Need a festive gift tag to tie onto holiday gifts? Want to make a bunting that’s Christmas-y and cute but easy to make? 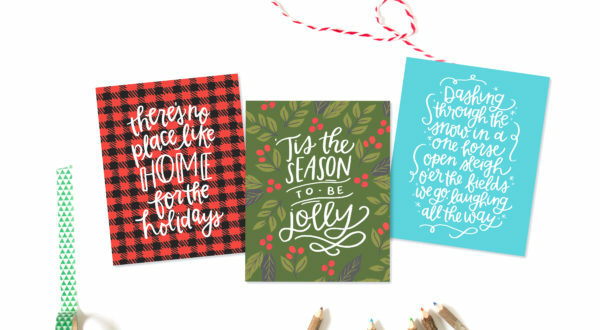 Print off this 3-pack of holiday themed printable art and size it to whatever suits your fancy! 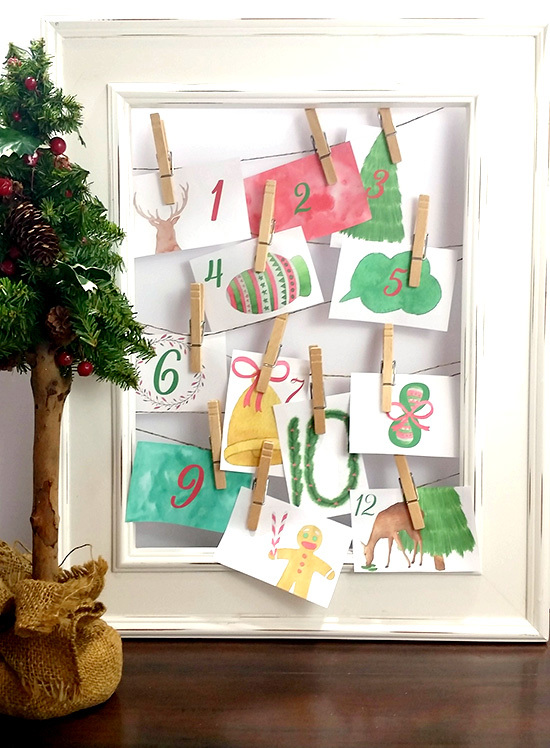 Frame for easy decor, size down and punch a hole in the corner to make a gift tag, or print all 3 cute styles and string up for an easy holiday bunting! All 3 styles are perfectly coordinated in the popular buffalo check and handwritten fonts together OR print separately to break them up. Whatever you do, we know you will love these cuties! 15. Favorite Holiday Recipes by One Good Thing by Jillee – Jillee says… Holidays = Happy Times in our house! There’s no place like home for the holidays, and not just the ones that take place in November and December. No holiday celebration would be complete without some really good food thrown in the mix! Christmas just wouldn’t be Christmas without My Mom’s Famous Sour Cream Cookies…and the 4th of July wouldn’t be the 4th of July without my Mom’s Homemade Ice Cream and Snickerdoodles! I love sharing the recipes that have become traditions in our family and a delicious part of our “happy times!” Find a new tradition for YOUR family in this beautiful collection of recipes my family uses to make the holidays special throughout the year! 16. Printable Christmas Planner by Planning Inspired – Get organized this holiday season! 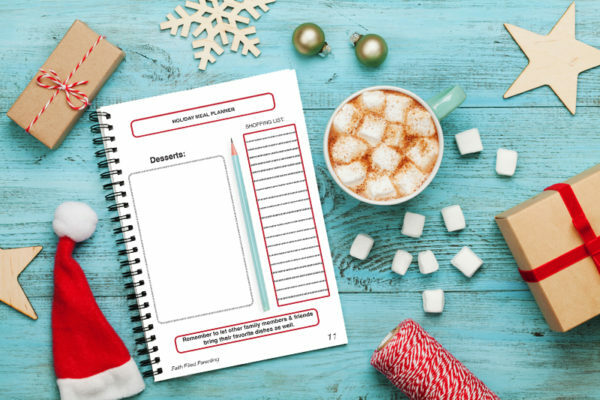 This Christmas Planner includes everything you need to take the stress & chaos out of the holidays! 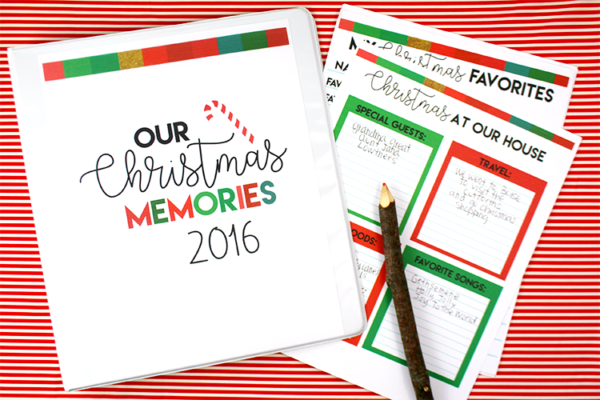 Use these holiday planner printables to create your own Christmas Binder and have the most organized Christmas ever! Print and punch for your 8 1/2 x 11 inch binder or similar sized planner! 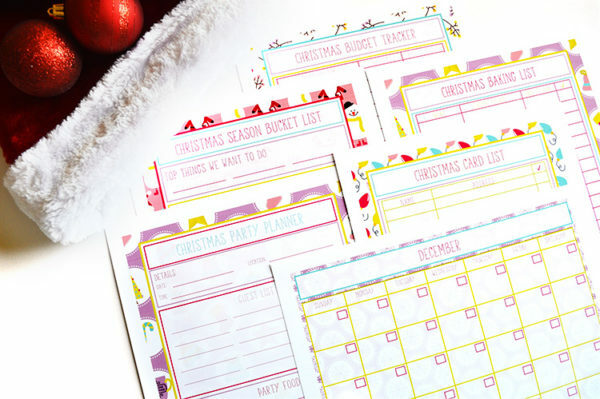 You’ll be oh, so organized with those printables! Get ’em now! 17. 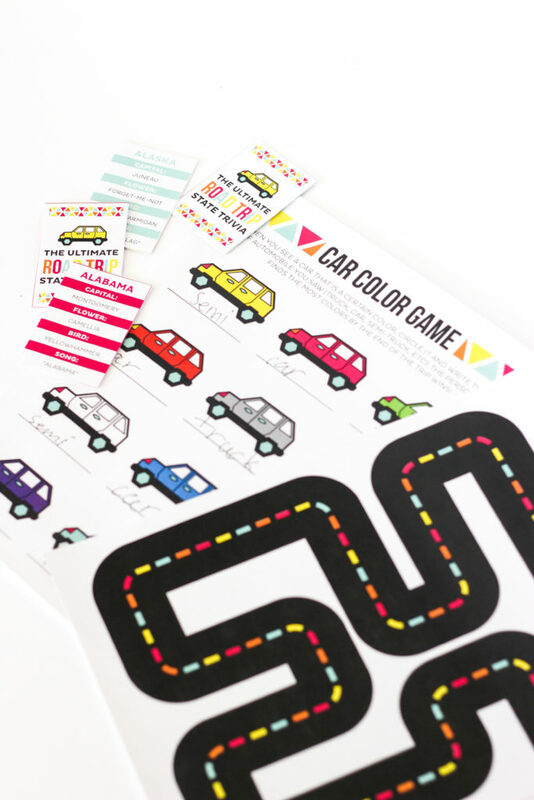 Ultimate Road Trip Bundle by Printable Crush – This Ultimate Road Trip Printable set includes everything your kids need to prep for your road trip, activities for the car, and pages to keep track of all the memories you make along the way! Set includes over 40 pages of bright, colorful and fun printables for all ages. 18. 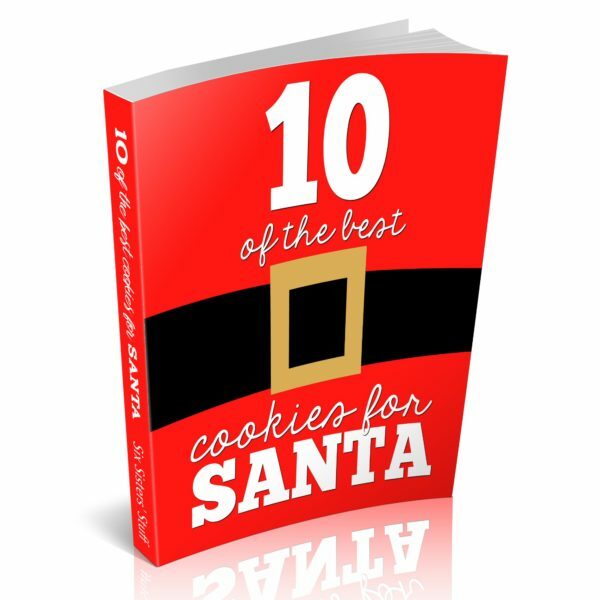 10 of the Best Cookie Recipes for Santa by Six Sisters’ Stuff – Santa will definitely leave you the best gifts on the block with this eCookbook! From festive and cutesy, to downright delicious – these cookie recipes will be the highlight of the season. Download the simple PDF eCookbook to any device and use it all season long. 19. “Pun”ny Christmas Song Neighbor Gift Tags by Somewhat Simple – Such a clever and simple way to put a smile on your neighbors’ faces this Christmas! 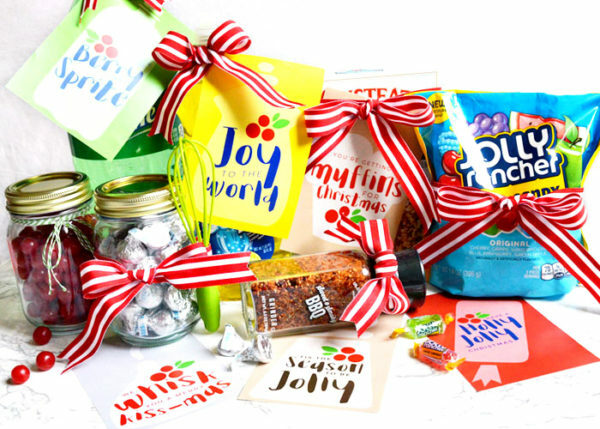 These tags will take the guesswork out of gift-giving this year – grab some muffin mixes, Sprite, Hershey Kisses, Joy Dish Soaps, seasonings, Jolly Ranchers, etc. and start ‘singing” your way to a less stressful holiday season! 20. Essential Holiday Recipe Guide Book and Holiday Printable Art by That Crazy Oil Lady – Do you LOVE essential oils? 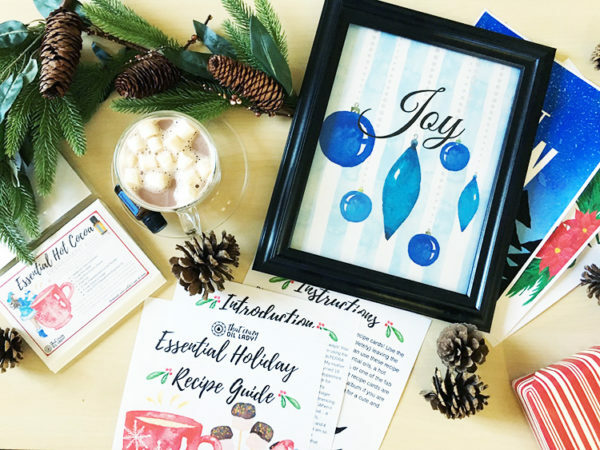 Whip up some crazy-awesome Christmas recipes in the kitchen and in your home with the Essential Holiday Recipe Guide and Holiday Printable Art set! These beautiful recipe cards are great to create family memories with, gift to a loved on this holiday season with some essential oils, or use as a gift tag along with the recipe you make yourself! You are not going to want to miss out on this beautiful bundle, that includes beautiful framable wall art as well! Simply print on paper or card stock and cut out the recipe cards! Use the outer red edge as your guide, (cut if off completely) leaving the outside edge of your Recipe cards white.You can use these recipe cards yourself, or gift them along with essential oils, a hot-cocoa ready mug with an essential oil bottle, or one of the fab brownie recipes in here, this holiday season! The recipe cards are the perfect size to put into a standard 4×6 photo album if you are looking to share this as a gift, or if you’re looking for a cute and pretty way to store the recipes in your own kitchen! Everything you need this holiday season is waiting for you! 21. 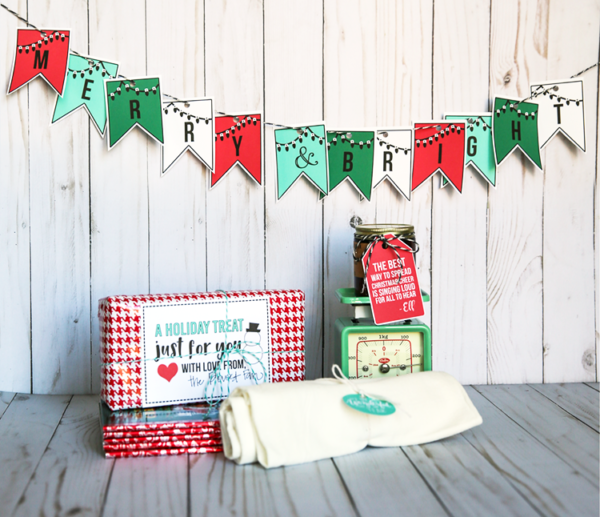 Christmas and Holiday Gift Tag AND Banner Set by Thirty Handmade Days – This adorable Christmas Gift Tag Bundle is perfect to make all of your gifts sparkle this holiday season. There are over 50 tags – from movie lines to handlettered awesomeness, for Christmas and the holidays in general. There’s also a Merry & Bright banner in there too. You will love all 7 pages included in this set! 22. 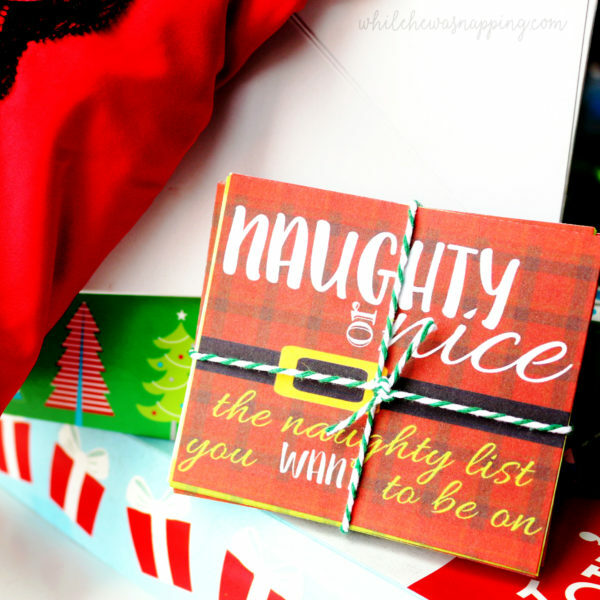 Naughty or Nice Love Coupon Set for Couples by While He Was Napping – Spice up your love life when your sweetie opens up these Naughty or Nice Love Coupons this holiday season! This is one naughty list your sweetheart should definitely be on! You’ll both thank me later. Included are 66 ready-to-print coupons, 4 cover options, and blank templates so you can customize them just for you and your lover; plus, printing is a breeze and assembly is simple – just print ’em out, cut ’em apart and wrap ’em up! BUT THAT’S NOT ALL! DON’T MISS OUT ON THESE BONUSES! If you grab your copy of the All Things Christmas Printable Bundle through one of my links, I’m going to throw in my own little mini bundle just for you! My little mini bundle is valued at $24 – that means you’ll get your money’s worth just from my bonuses! See?! Told ya! EVERYTHING you could ever want or need this Christmas! Buy now and save BIG! This All Things Christmas bundle has a value of well over $200 but you can get it all for just $15 – $20! Remember the price goes up tomorrow and this is only a 3-day sale! What are you waiting for?! RUN, don’t walk! Put a little hustle in your step and get the All Things Christmas printable bundle because the price jumps up tomorrow and it’s ONLY AVAILABLE FOR TWO MORE DAYS! Get on it! So, tomorrow is the big day! I’m SO excited to share this awesome sneak peek with you. I can’t spill all the beans on just what is in this holly jolly All Things Christmas Bundle, but here’s a quick little peek on just now this bundle is going to get you rocking around the Christmas tree this season. WHY IS THIS SO AMAZING? deck the halls with some gorgeous decor and art. plan the perfect holiday party in a snap! You’ll have everything you need to organize your party, step by step. 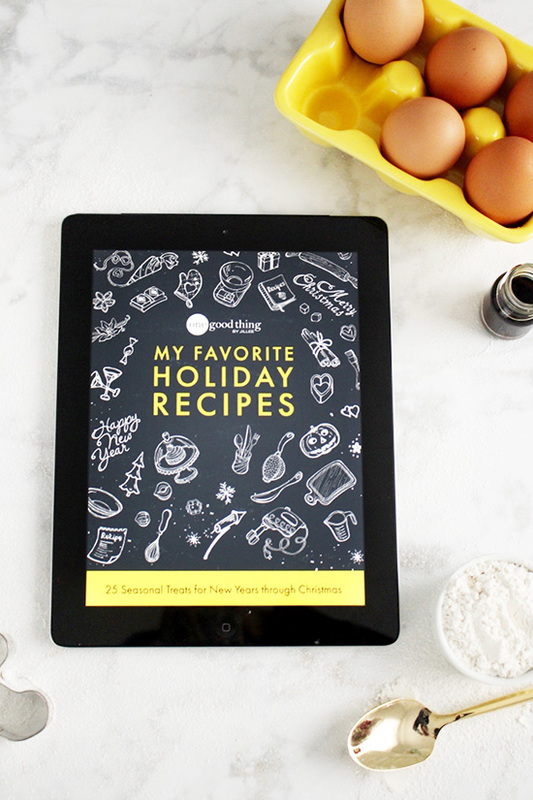 plan and prepare a delicious holiday dinner with amazing recipes your whole family will love. find great gift ideas and stocking stuffers to help with your holiday gift giving. I can’t say too much more about exactly what is in the bundle. Sometimes, the best part is the surprise and I’m not going to ruin it. Come back tomorrow and I’ll give you all the details, pinky promise. You won’t want to miss this. Trust me. I CAN tell you about the extra fun bonus you’ll get from me if you order your bundle from one of my links, though. It’s actually a little mini bundle all on its own! Some of my most popular Christmas products will be all yours, just for getting your awesome bundle of Christmas Cheer through my link. an activity the kids can make themselves that will keep giving all December long? something to spice up the holidays with your sweetie? a super simple stocking stuffer the kids will LOVE? a countdown for New Year’s Eve the whole family will enjoy? You want all that? Well, you GOT IT! But, ONLY if you order your bundle through my link. Subscribe to my email list and I will send you the link right to your inbox. Join my Facebook group and I will post the link in the group each day of the sale. Come back to my website tomorrow and find the post all about the Christmas Bundle Sale. Follow me on social media and follow my links on my posts about the All Things Christmas Bundle. This is going to be AMAZING! Make sure you don’t miss out on this once-in-a- lifetime bundle. After Friday, this bundle will break apart and you will have to get all the pieces separately. And I definitely WON’T be giving away my mini bundle again. It’s worth more than the price of the bundle all by itself. Don’t miss out! “How did this happen?” I thought as I stared back and forth between the two invitations. Yep, just as I had feared. I had committed to two different Halloween parties, in two different locations, on the same night, at the same time. Clearly, the holiday excitement had gotten the best of me and my organizational skills had taken a steep nose dive. 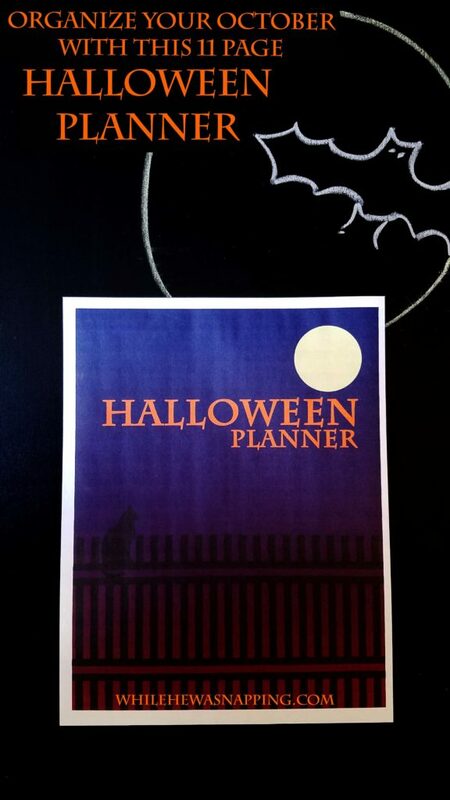 If only I’d had this Halloween Planner. Don’t let the holidays get the best of you. Put in a little bit of planning and a little bit of time and you’ll have the best Halloween ever. You won’t double book yourself, you won’t miss any costume details, you won’t forget to do any of your fun Halloween traditions. 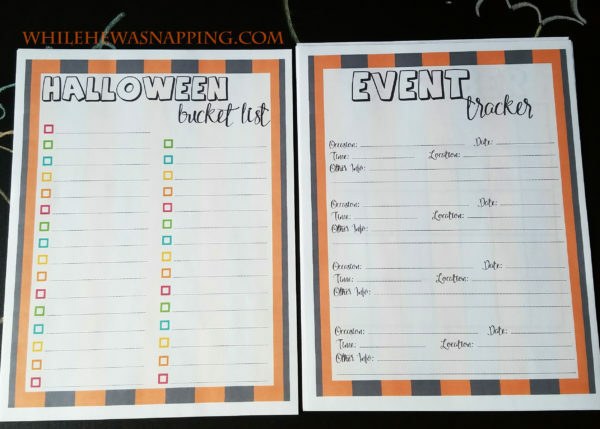 This Halloween Planner will help keep your October organized. I want to organize my October! Let’s download my planner! 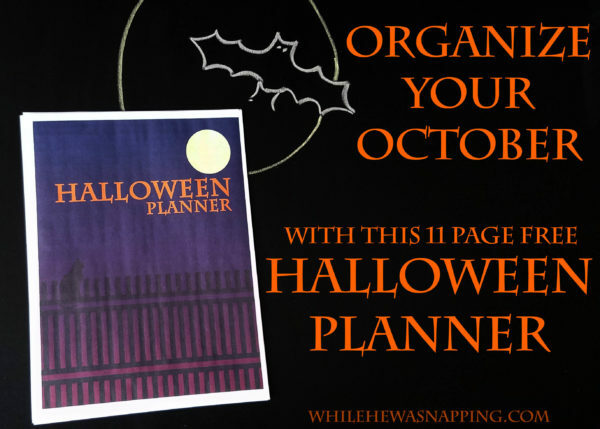 HOW WILL THE HALLOWEEN PLANNER KEEP YOU ORGANIZED? Use the Event Tracker and calendar to keep all your commitments and events within a glance. No double bookings! 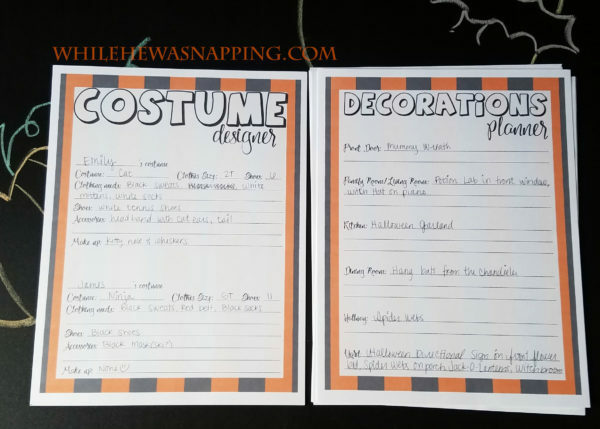 Plan all the costume details for the whole family so everyone looks their very best. Make a bucket list together so you don’t forget any traditions or so you can make some new ones. Plan the perfect Halloween party! 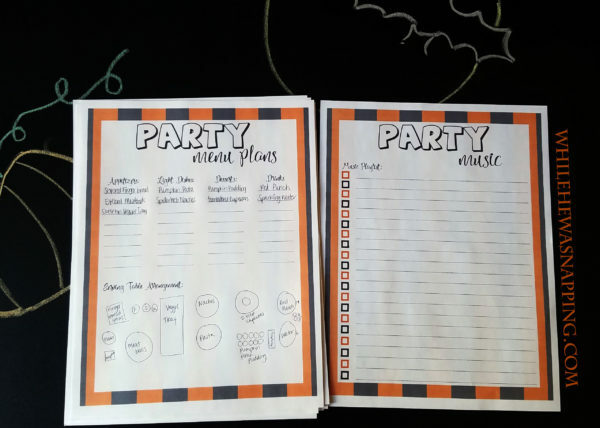 With 5 pages of party planning organizers, it’ll be so easy to keep track of all the details. I want to organize my October! Give me that my planner please! I called up my brother and had to tell him that we’d try to make their party, but that I’d double booked us. I arranged to drop off our food contribution that afternoon and apologized again. We spent most of the evening at the other party, but we did make a stop by my brother’s before we called it a night. And now I double, triple and quadruple check that we aren’t double booked during the holidays! And I use a planner to keep track of all those details. 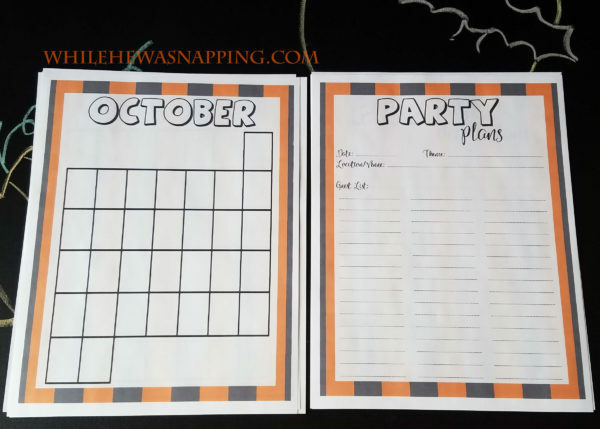 GET YOUR OWN HALLOWEEN PLANNER AND TAKE CONTROL OF YOUR HOLIDAY. I want to organize my October! Give me that planner! This 11-page planner is yours. I want you to have it so you don’t experience the same scheduling mishap I did. I’ll even send it right to your inbox. I want to organize my October! Give me that planner please! Print your planner at home, on regular 8.5″x11″ printer paper. Print copies of the pages you really want. And enjoy October while it’s here. Before you know it, we’ll be eating turkey and stuffing around the family table. Don’t forget to add your favorite Halloween activities to your plans. Get more ideas with this Halloween Bucket List! Or check out this one to find some fun activities the kids will love to do!